Geranium essential oil "signifies the archetypal energy of goddess culture, and encompasses the energy of the feminine," writes aromatherapist Valerie Ann Worwood in Aromatherapy For the Soul. Worwood goes on to say the emotional benefits of geranium essential oil (Pelargonium graveolens or Pelargonium x asperum) are to encourage solace, regeneration, adjustment, balance, tranquility, and steadiness. You may also see this essential oil called rose geranium (Pelargonium roseum). There are more than 250 species of geranium — for a detailed discussion of species used in aromatherapy, see this article. Production: Steam distilled from leaves of the plant. An absolute is also available and is commonly used in perfumes. Learn about the history and cultivation of geranium oil. Aroma: Combination of rose, citrus, and herb. Is geranium safe to use during pregnancy? Yes, in low dilutions to freshen rooms and after six months for skin application, according to Aromatherapy and Massage For Mother and Baby. Is geranium essential oil safe for children? Yes, but do not use on babies. Main components: Essential Oil Safety, 2nd Edition, lists components for four varieties of geranium: Chinese, Egyptian, Moroccan, and Reunion. The main components for all four are citroneliol, geraniol, and citonellyl formate, in varying amounts, with a range of other constituents depending on the variety. Aromatherapy: A Complete Guide to the Healing Art: Geranium is a balancing agent for many conditions. The scent may help regulate blood pressure. This essential oil is useful for relieving PMS, menstrual irregularities, menopausal symptoms, and fluid retention. In skin care, the oil balances all hair and skin types and helps relieve many skin conditions. Emotionally, the scent may help reduce anxiety, depression, irrational behavior, and stress-related headaches. The Heart of Aromatherapy: Geranium is useful for daily skin care, rejuvenating damaged skin, calming inflammation, and feeling relaxed and uplifted. Aromatherapy For Healing the Spirit: In Traditional Chinese Medicine geranium is one of the few essential oils considered cool and moist in energy. The oil clears heat and information, relaxes the nerves, calms anxiety, and can strengthen Qi-energy and encourage the circulation of Qi and blood. Conditions geranium may help relieve include psoriasis, eczema, acne, athletes foot, nerve and joint pain, hemorrhoids, varicose veins, excessive menstrual bleeding, and symptoms associated with menopause. 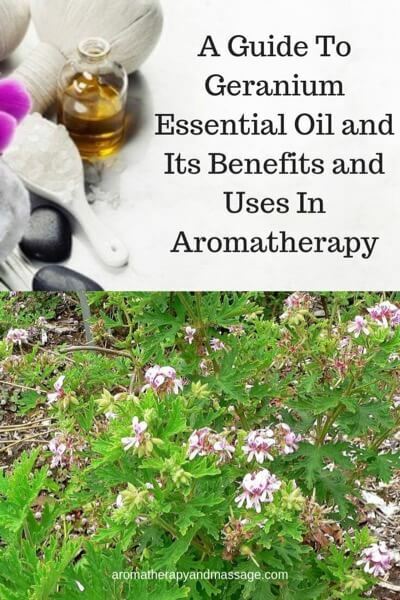 The Complete Book of Essential Oils and Aromatherapy: Geranium may help relieve female reproductive disorders, menstrual cramps, varicose veins, depression, fatigue, emotional crisis, and stress-related conditions. Illustrated Encyclopedia of Essential Oils: Geranium is good for skin care, improving circulation, relieving sore throat, relieving PMS and menopausal symptoms, and reducing tension and stress-related conditions. Put a few drops of this blend into your aromatherapy diffuser. Gently massage a little of this blend onto your face every night. Use this blend as a body wash.
Gently stir ingredients in a small bowl until smooth. Pour into bottle. Makes 30 washes. Combine the salts with the essential oils in a dark jar. Add one tablespoon of baths salts to warm bath water in the evening for restful sleep. Store the salts in a cool, dark place. Source: Elizabeth Ashley, "Menopausal Personality Changes and Anxiety," NAHA Aromatherapy E-Journal, Autumn 2016.3, p. 49. I recommend geranium essential oil from Young Living.